If your family's Christmas Eve tradition is the Feast of the Seven Fishes, but you don’t feel you have the skills to do it, this class is for you! Seafood is one of the healthiest fastest cooking foods that there is, yet I’ve found that it’s the food that people are most nervous about cooking. This class will make it easy for you. We will show you a classic way to cook mussels and clams, how to toss grilled shrimp with pasta, how simple it is to roast fish fillets, and a fabulously easy low odor cooking method of steaming between 2 plates, here in ginger and soy. Seafood made easy. Look and learn! Super fast and super delicious, Moules Marinière is a very French, very traditional and very easy way to cook mussels. In my opinion it is the perfect way to start a great relationship with these mollusks. Mussels are loaded with good nutrition for very few calories. They are inexpensive quick cooking, and rich in minerals such as selenium, potassium and iron, and in B vitamins, especially B12, are all things our bodies need to stay healthy but that are hard to get in quantity from plant sources. Ounce for ounce, mussels have more of these nutrients than steak! Try some! Our Grilled Shrimp Pasta with Mint Pesto and Peas is simply gorgeous to look at and delicious to eat. It is also the poster child for using freezer and pantry items to whip up a satisfying meal in minutes. It quickly marries a favorite pesto of mine with low calorie, high protein shrimp, studded with a smattering of that great pantry standby, frozen peas. 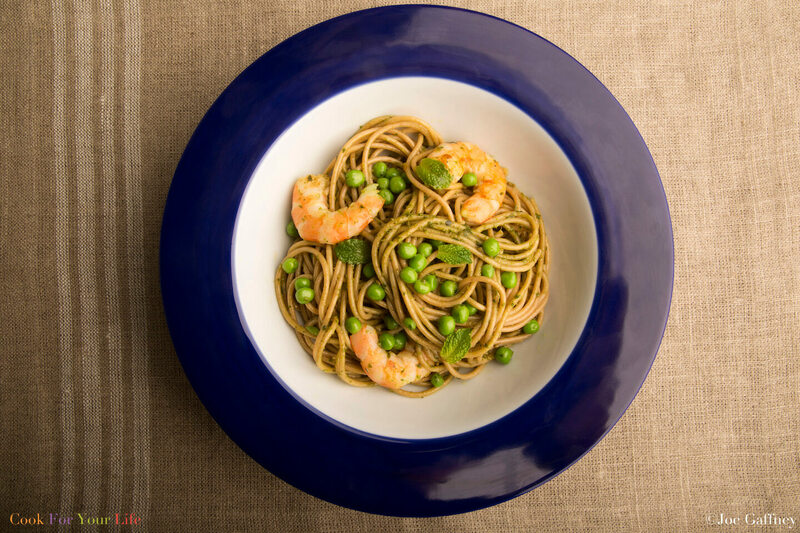 I usually keep whole wheat spaghettini in my pantry which takes under 5 minutes to cook, so if like me, you have pesto in your freezer too, by the time the shrimp are grilled, everything else will be ready to toss together. Try it! Halibut with Butternut Squash & Gremolata is a perfect fish dish for beginners in the kitchen. It is easy to make and delicious to eat. The mellow taste of halibut and the fresh green taste of gremolata work beautifully in combo with the sweet roasted squash and potato. If halibut is a little too rich for your pocketbook, you can use this same method to cook other thick firm fish, like cod fillets from the shoulder end, or fish steaks. If you’re feeling tired and weak, and your appetite is low, this tasty easy to make fish dish really is the perfect thing. The soy, ginger and scallion the fish is steamed giving it a delicate, clean flavor that goes well with steamed greens like bok choy and some plain white rice. If you’re up for it, the fat free vinaigrette sauce we suggest here will spice everything up a little. Best of all it is low odor.